Extrinsic vs. Intrinsic Motivation: What's the Difference? Why do we do the things we do? What is it that drives our behaviors? 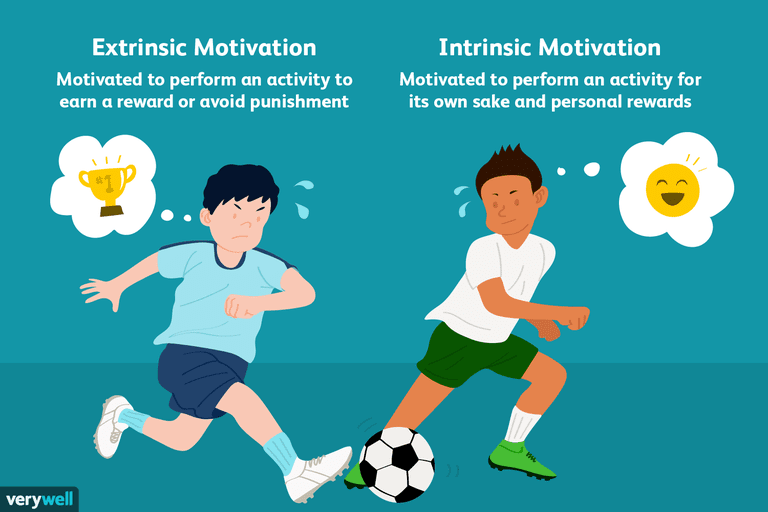 Psychologists have proposed some different ways of thinking about motivation, including one method that involves looking at whether motivation arises from outside (extrinsic) or inside (intrinsic) the individual. While both types are important, researchers have found that intrinsic motivation and extrinsic motivation can have different effects on behaviors and how people pursue goals. In order to understand how these types of motivation influence human action, it is important to understand what each one is and how it works. Extrinsic motivation occurs when we are motivated to perform a behavior or engage in an activity to earn a reward or avoid punishment. In this case, you engage in a behavior not because you enjoy it or because you find it satisfying, but in order to get something in return or avoid something unpleasant. Intrinsic motivation involves engaging in a behavior because it is personally rewarding; essentially, performing an activity for its own sake rather than the desire for some external reward. Essentially, the behavior itself is its own reward. Extrinsic vs. Intrinsic Motivation: Which Is Best? The primary difference between the two types of motivation is that extrinsic motivation arises from outside of the individual while intrinsic motivation arises from within. Researchers have also found that the two type of motivation can differ in how effective they are at driving behavior. Some studies have demonstrated that offering excessive external rewards for an already internally rewarding behavior can lead to a reduction in intrinsic motivation, a phenomenon known as the overjustification effect. In one study, for example, children who were rewarded for playing with a toy they had already expressed interest in playing with became less interested in the item after being externally rewarded. External rewards can induce interest and participation in something in which the individual had no initial interest. Extrinsic rewards can be used to motivate people to acquire new skills or knowledge. Once these early skills have been learned, people may then become more intrinsically motivated to pursue the activity. External rewards can also be a source of feedback, allowing people to know when their performance has achieved a standard deserving of reinforcement. Offering a reward might make a "play" activity seem more like "work"
While most people would suggest that intrinsic motivation is best, it is not always possible in every situation. In some cases, people simply have no internal desire to engage in an activity. Excessive rewards may be problematic, but when used appropriately, extrinsic motivators can be a useful tool. For example, extrinsic motivation can be used to get people to complete a work task or school assignment in which they have no internal interest. Unexpected external rewards typically do not decrease intrinsic motivation. For example, if you get a good grade on a test because you enjoy learning about the subject and the teacher decides to reward you with a gift card to your favorite pizza place, your underlying motivation for learning about the subject will not be affected. However, this needs to be done with caution because people will sometimes come to expect such rewards. Praise can help increase internal motivation. Researchers have found that offering positive praise and feedback when people do something better in comparison to others can improve intrinsic motivation. Intrinsic motivation will decrease, however, when external rewards are given for completing a particular task or only doing minimal work. For example, if parents heap lavish praise on their child every time he completes a simple task, he will become less intrinsically motivated to perform that task in the future. How Do Intrinsic Motivation and Extrinsic Motivation Influence Learning? Extrinsic and intrinsic motivation can also play a significant role in learning settings. Some experts argue that the traditional emphasis on external rewards such as grades, report cards, and gold stars undermines any existing intrinsic motivation that students might have. Others suggest that these extrinsic motivators help students feel more competent in the classroom, thus enhancing intrinsic motivation. "A person's interest often survives when a reward is used neither to bribe nor to control but to signal a job well done, as in a "most improved player" award. If a reward boosts your feeling of competence after doing good work, your enjoyment of the task may increase. Rewards, rightly administered, can motivate high performance and creativity. And extrinsic rewards (such as scholarships, admissions, and jobs that often follow good grades) are here to stay," explains David G. Meyers in his text Psychology: Eighth Edition in Modules. While intrinsic motivation is often seen as the ideal, both extrinsic motivation and intrinsic motivation are important ways of driving behavior. To comprehend how these can be best utilized, it is important to understand some of the key differences between the two types of motivation including the overall impact that each can have on behavior. Myers, DG. Psychology: Eighth Edition in Modules. New York: Worth Publishers; 2010. Plotnik, R. & Kouyoumjian. H. Introduction to psychology. Belmont, CA: Wadsworth; 2011. Why Does the Overjustification Effect Reduce Intrinsic Motivation? What Is a Bachelor of Arts and Bachelor of Science in Psychology?